A cutting wind whipped against Eugenia, making her jacket ripple like waves as she walked around the Patagonian coast. All around her, stretching to the ocean was an endless gathering of two-foot-tall, squawking penguins. This is San Lorenzo in southern Argentina, likely the largest colony of Magellanic penguins in the world. Around 210,000 pairs of penguins are here, carving their nests into the semi-desert soil until it resembles Swiss cheese. Some of these penguins are tagged with metal bands around their left flipper and Eugenia navigates through the colony searching for glints of sunlight reflecting off the metal. Each band has an identification number she can use to determine if that penguin is native to this colony or has migrated from elsewhere. Many penguins acquired their tags as chicks, and as Eugenia would soon learn, for some that was a very long time ago. Eugenia Bertagna works for a travel agency that helps manage the land where the penguin colony is located. It’s not unusual in Argentina for a penguin colony to spring up on private land, so a key part of the Global Penguin Society’s (GPS) work is to build relationships with land owners and managers to ensure land is used in ways that don’t disturb the penguins. 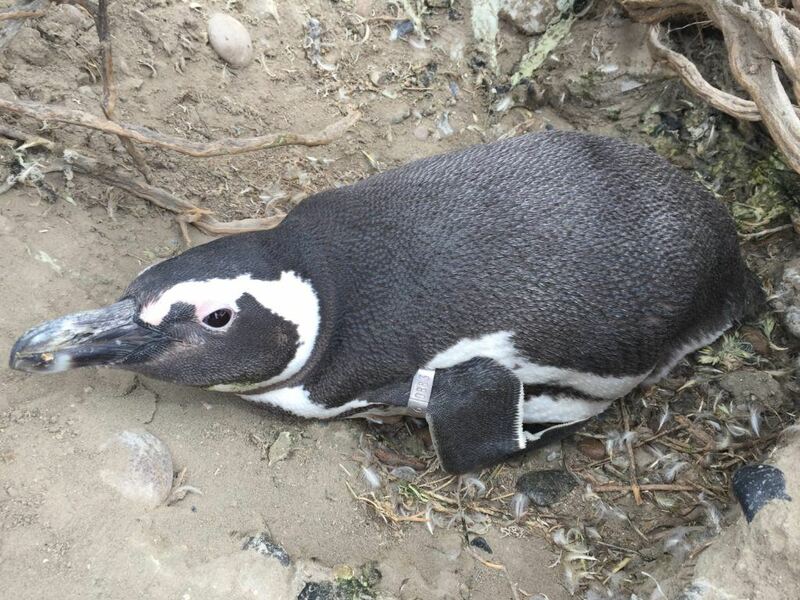 Eugenia and Pablo Borboroglu, president of GPS, are currently working on an agreement that would allow GPS to officially monitor the San Lorenzo colony, to provide management recommendations, and to establish an information center about penguins there. As part of this partnership, Eugenia and others at the agency locate penguins with identification bands and record their findings for GPS. Scientists have been banding penguins for decades, though it’s difficult to gain continuous data on individual birds—many don’t return to the same colony and those that do become lost in a crowd of thousands. So, you can imagine Eugenia’s surprise when this October she discovered a penguin who was banded as a chick almost 32 years ago in Punta Tombo, a colony located 186 miles south. This penguin was part of a long-term study that began in 1986, but hadn’t been seen since. This finding was not just a probability longshot, it taught GPS that penguins could live longer than expected. Researchers had assumed 30 years was the maximum lifespan for penguins. This bird was 32 and while those numbers might seem too close together to be significant, they’re not; since penguins are vulnerable to a host of threats from predators, pollution, and changing ocean conditions, every year of life is a big deal. This exciting discovery underscored that long-term research is critical to understanding more about penguin behavior, migration, and colony structure—knowledge that is critical for protecting these endearing birds.